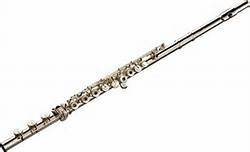 ​The flute is a transverse (side-blown) woodwind instrument made of metal. It is played by blowing a stream of air over the embouchure hole. The flute has essentially three registers: low, middle, and high, each with a unique timbral quality.